A 72-year-old woman presented with intermittent diplopia. She had a history of vascular disease, but no history of stroke or psychiatric disturbance. On examination, she developed convergence spasm with associated miosis following fixation on near targets and during horizontal smooth pursuit (video, figure 1). The spasms were terminated with a blink. She had no ptosis, her eye movements were normal in range, and her pupils were equal in size with normal reactions to light. Neurologic examination was otherwise unremarkable. Five years prior to her current presentation, a left-sided terminal carotid artery aneurysm had been incidentally detected. The aneurysm gradually expanded to a diameter of 2.4 cm and compressed the midbrain (figure 2). The intermittent diplopia had developed in the months following endovascular coiling of the aneurysm. 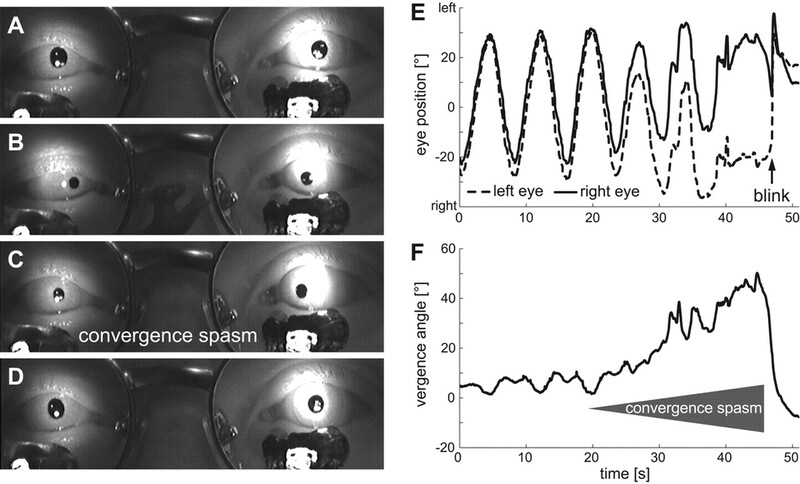 (A–D) Convergence spasm precipitated by fixation on a near target and released after a blink (video, A). (A) During fixation on a distant target, the patient has mid-range pupils. (B) During fixation on a near target, the patient converges and has miotic pupils. (C) After the near target is removed, convergence is maintained. The pupils remain miotic, which helps to differentiate from bilateral sixth nerve palsies. (D) After a blink, the patient is able to re-fixate on the distant target and the pupils return to mid-range diameter. (E) Binocular search coil recording during sinusoidal horizontal smooth pursuit, in which there is a period of convergence spasm that is released by a blink (video, B). (F) The vergence angle progressively increases up to 50° during the period of convergence spasm (gray triangle). (A) MRI 5 years prior to onset of symptoms. (B) MRI at the time of presentation with convergence spasm (after endovascular coiling of the aneurysm). The authors thank Dr. Geoffrey D. Parker for help with the interpretation of the MRI. Supported by Garnett Passe and Rodney Williams Memorial Foundation.